The Scouts, Cubs and Beavers (plus parents/family) made their way up the downs, passing “Rest and be thankful” over Southwick Tunnel onto the open down-land, where we stooped just past the trig point on Southwick Hill for a group photo and refreshments! From here the beavers headed back to the hut for hot dogs and drinks, but the Cubs and Scouts continue on round the “block” for a 4 mile walk. Beavers were fed first at the hut,. 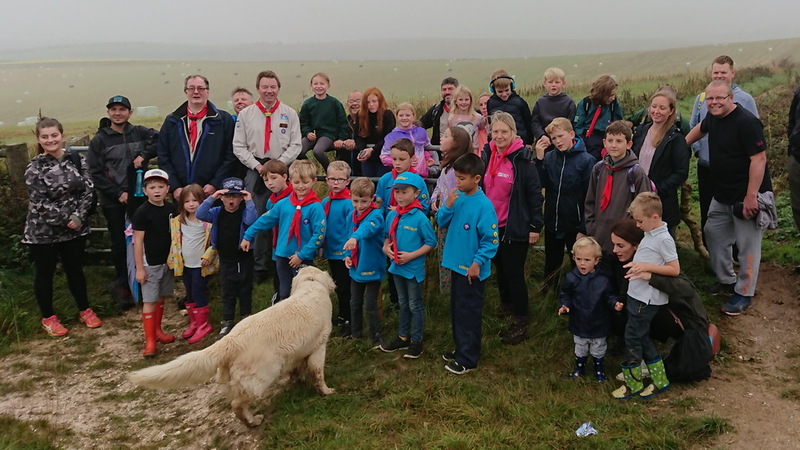 closely followed by the Cubs and Scouts. A great morning, and we were exceptionally lucky with the predicted rain. Again thank you for all those who took part, and we will let you know who much we raised all together.